Växjö is the very heart of southeast Sweden – in the middle of Småland, in the middle of southern Sweden. There is a lot to see, experience and do here – unique shops and world-class restaurants. A thriving culture and art programme, an intimate café culture and several award-winning culinary eating-houses. If you would like to experience genuine Småland nature, take one of the many cycle and footpaths straight out into the forests! A kingdom of crystal is just around the corner, as is the kingdom of furniture. Welcome! Opening hours: Shopping areas in Växjö are normally open weekdays 10-18, Saturdays 10-16 and Sundays 12-16. 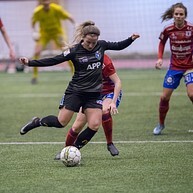 Växjö DFF has in a few years gone from divison 1 to the highest division in Sweden, Damallsvenskan. Myresjöhus Arena holds around 12 000 spectators and lies in the Arena City of Växjö. Tickets to Växjö DFF:s games can be purchased at Myresjöhus Arena. Östers IF has a long football tradition and the club dates back to 1930. The team plays in the next highest division, Superettan. Myresjöhus Arena holds around 12 000 spectators and lies in the Arena City of Växjö. Tickets to Östers IF:s games can be purchased at Myresjöhus Arena or online. Cycling is popular in Växjö. We have many excellent cycletours to discover - everything from the "Växjö eight" of 8 km to Sydostleden of 270 km. You can also cycle "Växjö runt" (around Växjö) - just over 40 km. Click on the weblink to see all cycletours in Växjö. Växjö cathedral is one of Småland´s most visited places with some 130 000 tourist visitors every year. The church is from the 12th century. 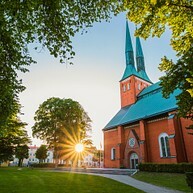 The cathedral is located close to the shore of Lake Växjö. The imposing twin steeples can be seen over virtually the whole town. The cathedral, large and light, is full of Småland studio art glass and a wander around the building takes us through several of the bible's narratives. The triptych altar screen, sculptured by world-famous glass artist Bertil Vallien, forms the tree of life: from death to life. 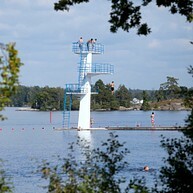 Leo´s Lekland is the children's paradise. 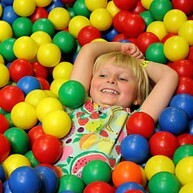 The play area of 5,600 square metres is on three floors with suspension bridges, an ocean of balls, tunnels and different types of slides. Other activities include air-hockey, pedal cars and trampolines. While the children play around and get up to whatever mischief they want to, parents and friends can socialize and eat well. In the parents lounge there is a café, TV, open internet network as well as range of newspapers and magazines. Växjö swimming baths & Aqua Mera has exciting adventure pools. What's more, this family swimming and keep-fit facility also contains a 25 metres pool with diving boards, a multi-pool for teaching, swimming school, gym, group training, solarium and cafeteria. On "Glasgatan"/the Street of Glass Art you can see the work of world famous studio glass designers. Seven glass artists were commissioned to do a sculpture to adorn the central street Sandgärdsgatan in Växjö. The result was the Street of Glass Art, which opened in 2011. In one end of Sandgärdsgatan lies Växjö cathedral that wraps up the Street of Glass with it´s triptych altar screen, sculptured by Bertil Vallien. The artists of the Glass Street are Bertil Vallien, Ulrica Hydman-Vallien, Kjell Engman, Göran Wärff, Ludvig Löfgren, Åsa Jungnelius and Anna Ehrner. The garden participated in Chelsea Flower Show in London in May 2007 - Europe's most prestigious garden show. It was awarded a gold medal and received a great deal of attention.The garden is permanently displayed on the shore of the Trummen Lake Växjö. The Linnaeus Garden was designed by the landscape architect Ulf Nordfjell. He has created a modern Linnaeus tribute garden that reflects today's interest in architecture, art, design, nature and gardens. Familiar wild varieties are displayed in simple arrangements with typical Linnaeus varieties, all framed by traditional Swedish materials such as granite, timber and steel. For those of you who would like to experience Småland culture up close, Culture Park Småland is a "must-viist". 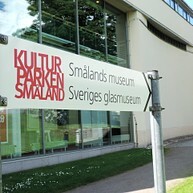 In the lovely "museum park", in central Växjö, lies Småland's Museum, the Swedish Glass museum and The House of Emigrants. Here you can visit the magical world of glass and travel through it in an exciting environment. Discover the silver treasures of the Vikings for example. In addition to glass in all its forms there are exhibitions about the history of the region. The museum contains both a café and a shop. In the middle of town lies Växjö´s modern skate and parkourpark. It is a modern concrete park that has everything that skateboarders and in-liners need. In 2015 the parkourpark stood ready. The park is located close to Växjö city center and it´s shops, cafés and restaurants. 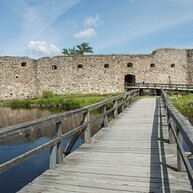 The ruins of Kronoberg´s castle is a well visited sight in Växjö, especially during summer times when the café is open and the seamboat S/S Thor runs on Lake Helga. Experience the history of Växjö in a beautiful set of nature. The bishop`s palace of Kronoberg was built during the 1300`s. The fort gradually evolved into a castle made of wood and stone. In 1542 Nils Dacke and his rebels seized the castle, after the rebellion was squashed the castle was seized by Gustav Vasa He subsequently extended the castle into a fortification with a large number of cannons. The main reason for the extension was to give the king a firm hold in Småland in an attempt to prevent further uprisings. The fortification eventually became part of the national defence system, and was conquered several times by the Danes. After the treaty of Roskilde, however, the fortification lost its importance and fell into disrepair. 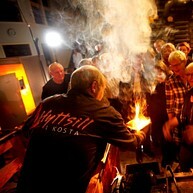 Hotell Björkängen has extensive experience in serving hot-shop herring at Kosta Glassworks. Hot-shop herring is an old tradition in the Kingdom of Crystal that goes back to the time when the blowing room was also the district’s gathering place. Visitors are invited here in the evening for food prepared in the annealing furnaces, beverages, entertainment, drinking songs and glassblowing by master artisans. A unique experience and typical of the Småland region. A living reflection of Swedish industrial history. Beautiful environments with manor house, kitchen garden and orchards, several museums, naturum, craftsmen, pleasure boat and much more. Exciting summer exhibitions in the Manor House, the iron works and the gardens. Café, restaurant and shops. Open the Easter weekend, weekends in May, daily June - August, weekends in September. Huseby Manor also provides the biggest Christmas Fair in the Nordic countries in the beginning of November each year. Just north of Växjö, along the shore of Lake Helga, is the recreational area of Evedal, originally a spa resort from the 18th century. Here you will find lovely beaches, a marina, a ramp that can be rented to launch your boat, canoe rental, mini-golf, football pitches, adventure golf, footpaths, an inn, restaurants, hostels and camp site. Växjö really is the promised land for fishermen. Apart from the lakes Åsnen, Salen and Helgasjön there are numerous smaller lakes, rivers, streams, brooks, ponds and game fish pools. You can even fish in the central lakes of Växjö that lies only a stone´s throw from the city center. The more than 300 lakes and waterways virtually ensure an exciting fishing adventure. Free fishing app for iPhone and Android called Fish Kingdom. Boats can be rented and fishing guides booked in the area. Contact the Tourist Center for more information and to purchase your fishing license. A unique Swedish adventure in the deep forests of Småland. At the adventure grounds, Little Rock Lake, there is a zipline that is the biggest of its type in Northern Europe. Along a wire stretched between towers, platforms and trees you will, hanging in a harness, reach speeds of 70 kph between 10 and 52 metres above ground. Little Rock Lake is located close to Klaverström, about 40 kilometers from Växjö and is a perfect day trip from Växjö. Boot Camp Växjö is a 250 meter long obstacle course with 15 obstacles. It is a though course inspired by military courses and it is supposed to be physical challenging. The obstacle course is placed outdoors at Kampaängen around lake Växjö. Next to the obstacle course there are landscaped fields for volleyball and football, also outdoors. All activities are free of charge and open for everyone to use.